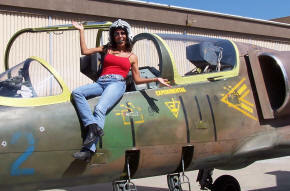 Imagine the thrill of flying a real Fighter Jet Trainer! EBAS orientation/demo flights offer all the thrill of a true Top Gun experience with the safety margin and comfort of being with a REAL Eastern Bloc Fighter Pilot with over 6000 hours of flying experience. Steve Kalmar was not only a fighter pilot, but a fighter pilot INSTRUCTOR who taught new fighter pilots how to make these planes dance! Want to try your hand at the stick? The L-39 Albatross happens to be one of the easiest jets to fly and offers the classic “fighter pilot” view through the large clear canopies. Nothing makes jaws drop faster than talking about flying a Fighter Jet. With a current medical, you can log time and attain an L-39 type rating from an FAA approved check pilot. Invite your family and friends to share in the excitement and once-in-a-lifetime experience of these exciting Demo Flights! A viewing area is located next to the runway where onlookers can take photographs of your take-off and landing. 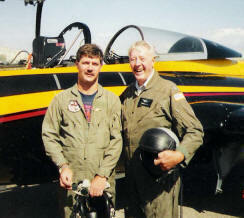 James P. flies a 172, but like most pilots, he wanted to feel the “fighter pilot” experience. 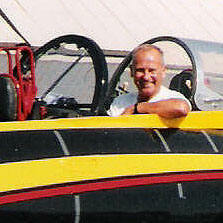 "I’ve done aerobatics in the past but I never imagined the G-forces would be so dramatic at higher speeds. It handled fantastic. Light on the stick and very responsive"
Ex-Air Force Pilot who currently flies a T-34 mentor. "As a former US WWII military fighter pilot, I can tell you that feeling the thrust of the L-39 is something that I will never forget." Anna's two daughters came down to photograph and congratulate their mom on a successful flight. Anna's flight had been donated by EBAS to a local charity and her winning bid made both Anna, and her charity, VERY happy! Flights are available by appointment 7 days a week. The L-39 combines the visual appeal of a Jet Warbird with the easy handling characteristics of a primary trainer. A series of complex back-up systems offer added safety for pilot and co-pilot. It’s currently used as a Russian trainer and as a Light-Weapons Fighter in several countries.